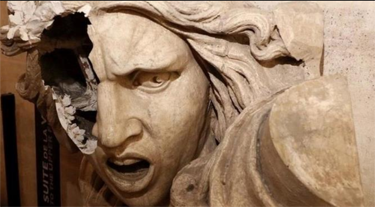 Smashed face of the Marianne statue inside the Arc de Triomphe. There are elements to this affair that remain unclear if not murky. Who are the gilets? What do they want? Can this really be a spontaneous revolt, triggered by a posting on Facebook, provoked by increased taxes on fuel? Christophe Castaner, who has been minister of the interior for only a few weeks, and is already one of the most hated men in France, has rushed to blame the violence on the extreme right. There is not the slightest evidence of this. As far as I can tell, the rightists spent the weekend watching the news channels and posting acerbic comments on social media. ‘I’m running out of popcorn,’ one delighted Marine Le Pen supporter told me from the safety of his armchair, as he revelled in the humiliation of Macron. In Paris, there were many people wearing gilets jaunes, but were they really gilets jaunes? . . .These protests have been hijacked by political and criminal opportunists, but Macron is making a fatal error if he thinks he can brush off the concerns of my neighbours, who are handing out biscuits to passing motorists, most of whom have posed a gilet jaune on the dashboard in solidarity. 3 Feedbacks on "The Revolution in France"
Who is responsible? There must be a way to blame the two usual suspects, Russian bots and the Jews. Liberal/Marxist hoaxes (e.g., climate and gun control) favor the wealthy elites and impoverish [expand income inequality] normal citizens. Because raising the proles’ energy bills will make everyone richer. Climate Change Is A Marxist Hoax. The climate models consistently have been wrong. In 2008, Algore shrieked, “The entire North polarized’ cap will DISAPPEAR in five years.” That would have been four years ago in 2013. FYI up there it is still frozen. Environmentalism is cool and liberals don’t care if millions of little. brown children die. 18 June 2018: Green energy makes Ontario, Canada the most debt-ridden province on Earth. We had been assured that making energy much more expensive would make us all much richer.